Storm Katie shook and rattled the tent to hell and back. The trees howled and groaned in the wind. The rain lashed the fly sheet so hard it was close to ripping. Apparently. Apparently? Well I slept like a log save for a brief toilet break. Sharon on the other hand has hardly slept, gripping her sleeping bag tight expecting to be swept away by a tornado or a tidal wave. This is most unusual, Sharon can typically sleep on a washing line and I require sumptuous comforts. I have had more practice at sleeping through storms in a tent though. This morning the comforts of the common room once more make life that much more pleasant. Curiously after breakfast as we decamp the rain is only very light and the sun pops out here and there between the clouds. The wind has dropped too. The tent goes into the bag wet otherwise packing up is no more difficult than normal. It's time to leave Ledbury and head home. We ride out onto the country lanes once more and start heading north. The bike feels a little weird today, a bit loose, I suppose it's just the luggage, mind you it felt a little loose yesterday too. Nah, it's just me being paranoid and the bike getting old. That rear tyre is getting on a bit too, it'll need replacing before we go to The Netherlands later this year. Thanks Ledbury, it's time we got going home. By accident rather than design I find our way north to Bromyard and pick up the sign for Tenbury Wells. The B4214 is something of a cracker! Despite my overladen 125 shimmying and shaking over any striations in the tarmac it is gratifyingly joyful to curve the bends and sweep the corners. There is some washed out gravel and dirt here and there from last night's excess precipitation which keeps us focused. We swoosh and sweep from left to right then up and down as the signposts count down to Tenbury Wells. I think I shall return to this neck of the woods for more play time. 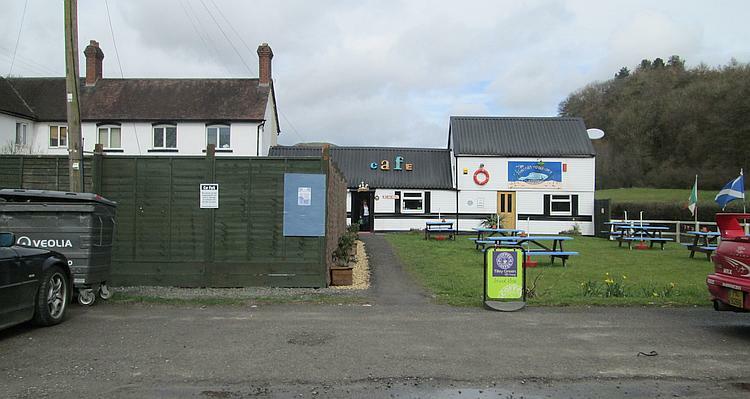 I spot The Lazy Trout cafe at the side of the A49 and pull in, it's brew time. This bike really is not right. It's no good, I dig out the tyre gauge from beneath the tent and the pans and the torch and the pegs and to my dismay the front is showing a mere 8 pounds - it ought to be 25. I closely inspect the tyre and there's no sign of a foreign object, hmmmm. I fish out the bicycle pump and with furious gusto I re-inflate the front tyre as much as my weak and feeble arms can manage, that'll be 22psi. It's not right but it's a lot lot better than it was before. The Lazy Trout is a little gem of a place. Compact and cosy the gentleman behind the counter is welcoming and the food is fine. We take some time out to chat and relax. This is odd for me. I've not been a sit still kind of guy and with the bike not being 100% I feel as though I ought to be stressed and worried. I am marginally concerned and just a tiny bit frustrated with the leaking front tyre, a few years back I would have been panicked, scared and angry. Am I getting old, am I becoming a better traveller, am I growing up? Probably a bit of all this and more. I am changing, I can actually feel that I am changing. How odd. We're just chillin at The Lazy Trout. 22psi seems to be more than enough and normal service is resumed. Well, I say normal service, Honda CBF 125s probably should not be ridden with the throttle wide open and with this much luggage for 3 hours. Speeding? No, no sir, not at all, my velocipede and I can barely manage 55mph in the countryside, most if the time it's more like 50mph. Pfffft I'd like to see any of these plastic rocket riders in their power ranger gimp suits ride THEIR bike for 3 hours with the throttle wide open. Ha! We all make it home successfully. Sharon makes me a brew and a nibble at her place then I use her foot pump to achieve the correct pressure in my front tyre before I make my way back to my pad. Ledbury is certainly worth a visit. I...I still suspect Ludlow has more to see but if you accidentally end up in Ledbury like we did then don't be disheartened. 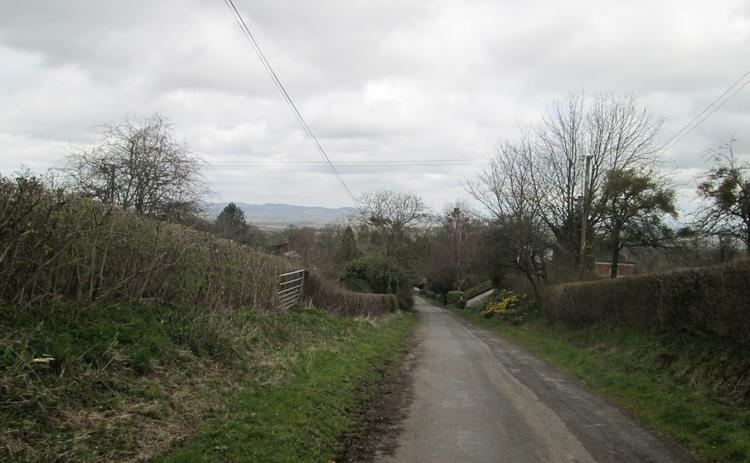 The countryside around is fine too with plenty of back roads and country lanes to explore if that is your thing. While the scenery lacks superlatives or the wow factor it is still bona fide countryside with all you'd expect. We were lucky it seems. We got wet on the Saturday when we travelled down but Sunday and Monday's rides were blessed by some sunshine and only the occasional light shower. Ooooop norf, back home they'd really caught the worst of the weather during the daytime. Oh, and finally it's worth noting that Sharon's dry weather riding speed is coming along a treat. She's sweeping through the bends and flowing around the curves well. Soaking Ride South Our dubious duo take 2 overloaded 125s to a place they never intended to visit in weather set to get worse. While doing this they get lost and get wet. It's not all bad news though. Dawdling Around Ledbury Sharon and Ren take a little walk through Ledbury then a genteel and leisurely ride around the area. Later that evening as a tempest rises outside there's a treat in store for Sharon. Lucky girl. Wobbling Home Our heroic duo manage to survive Storm Katie and now it is time to return home. This leaves Ren feeling a little deflated which doesn't help with the handling on the 125.